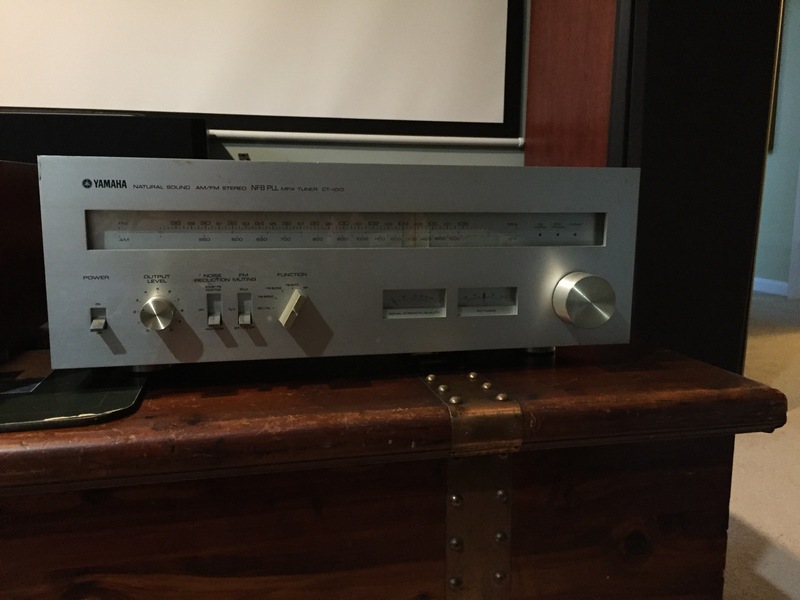 I just set up a simple but beautiful vintage setup in our new reading room: Pioneer SX-1080 and a pair of Klipsch Heresys Series I. I saved the Pioneer from a neighbor and fully cleaned and lubricated all of the switches, panels, and lights. Looks and sounds great. The Heresys just arrived from their first owner, who purchased them in 1984 and is now downsizing pending retirement. Together the Klipsches with Pioneer is a great pairing. The super-cool power meters on the pioneer bounce along to the music, albeit only a tiny amount given the efficiency of the Klipsches. I’m impressed with the bass performance of the Heresys given their reputation as a bass-light speaker. The lowest octave isn’t strong but is present, and the mid bass is balanced. Perhaps my wall placement is helping here. This system is getting a lot of playing time at low levels, pushing background jazz and classical through the house. Some would say the magic of the Heresys are lost in such an application, however I’m finding the opposite – in critical listening these immaculate but middle-aged speakers are missing some of the dynamics and detail of other Klipsches I’ve had, and their polite bass makes them only mediocre party speakers. The horns seem to project well and I’m getting really nice sound projecting through different rooms. The Pioneer’s excellent FM reception is helping here too. These Heresys are beautiful and deserving of some more attention. I plan on putting in new capacitors and inductors to liven up the sound, and perhaps adding some damping material to decrease resonance and improve bass response. Living in the DC region has its pluses and minuses – there are lots of great free museums, a ton of sports teams to root for, schools are pretty good, and you’re never too far from a protest. And group karaoke is an adult competitive sport. There are also minuses aplenty – traffic is universally horrid at all hours, it’s a swamp (literally and politically), group adult karaoke is REALLY competitive. One of the unequivocal pluses has to be the critical mass of audio hobbyists and stereo nuts. One of those nuts (using this term as endearingly as possible) is Gary Gill, who has been organizing an audiophile gear and trade show called Capital Audiofest for over a decade. It’s grown into a massive event with almost 100 exhibitors of speakers, turntables, receivers, amps and other assorted audio esoterica. Everything you can imagine is there to see, with an emphasis on high-end gear, extreme performance and impeccable style. Classic Audio Loudspeakers T-1.5 Reference. 18″ woofer, 15″ midbass woofer, 4″ Beryllium diaphragm midrange compression driver mounted in a wood tractix horn. Consumer brands were not well-represented, with a couple notable exceptions – TAD (affiliated with Pioneer) had their Reference line available for demos in two rooms, and Technics brought their new GU-8700 digital integrated amplifier, a couple pairs of their reference speakers, and an all-in-one media player/amplifier, all driven by one of their two latest 1200 series direct-drive turntables. Technics Grand Class SU-G700. I’m a sucker for meters. I really liked hearing the Grand Class SU-G700 integrated amplifier. It’s a full-digital amplifier, which means it transmits to the speakers in a lossless digital signal, even converting analog input signals to digital using high-performance onboard Burr-Brown DACs. It pushes 70 watts into 8 ohms and 140 into 4 ohms, which is plenty for most speakers. I’d love to carry one home. The German Physiks speakers were unique – one massive carbon-fiber unidirectional cone sticking straight up, with a woofer stuffed into the base. Kind of a modern take on the old Ohm Walsh speakers, except for $30k+. They sounded great and looked like aliens. One of my favorite speakers to listen to were the Audio Charney Companions. Each the size and shape of a mailbox, he Companions had one 5″ Voxativ full-range speaker perched on the front of its exquisite woodwork. Looking under the rear of the speakers revealed a 104″ folded horn crafted out of smoothed birch. Running off of a quarter watt of tube amplification, these things roared, pulling rib-scraping cello riffs across the soundscape. They’re rated down to 40hz and my bowels can attest they get down there or farther. Unbelievable. Turntables came in all shapes and sizes. Prices were uniformly high – the cheapest VPI I sampled was $900 and sounded great. Others on hand reached into six-figure range. I have to say that on these price-no-object systems, vinyl took on a new life. I was amazed at the clarity and color pulled out of the discs. I didn’t even think it was possible, and wonder whether sound engineers mixing some of these revered jazz pressings in the 1960s could ever fathom that some day there would be audio systems capable of completely bringing these artists back into the flesh. My favorites still have to be the Vanatoo Transparent Ones. They’re small, relatively affordable ($499) powered speakers with integral DAC. They shouldn’t be my cup of tea – no horns, no tubes, no ancient walnut veneers – but they’re happy. They sound happy. Well-rounded, accurate, beautiful imaging and detail, no fatigue at all. 60 watt amps run a 5 1/4″ aluminum woofer and a silk dome tweeter with a passive radiator on the back. They’re tiny, 6x10x8 inches, and that’s even with one of them packing the amp, USB, optical, coax and analog inputs, a set of speaker outputs, a run for a sub, and volume, bass and treble controls. It’s a whole system in the palm of your hand. This is the third year I’ve heard the Vanatoos, and they, more than anything make me question why I obsess with the rest of the audiophile gear. They really sound that good. I took a picture of the new Transparent Zeroes, which are even tinier, pack more tech, and sound excellent as well. I kept coming back to the ones, however. I don’t remember what these are, other than they are open-baffle arrays. Those are large brass discs hung on there too, to eliminate resonance. I guess that a slight curve to the disc increases their rigidity, so each is slightly unflat. Neat. These are speaker cords with massive, humungous rare-earth magnets to do something or other. Maybe nanoparticles? They look neat. And it’s been featured on The Discovery Channel. Showcase of beautiful gear. The stands themselves are likely worth more than my car. My second favorite speakers were these Odyssey Kismets. Simple principle – one Scanspeak Revelator woofer and one illuminator tweeter. Put to good use. Here are the gorgeous Fern and Roby horn speakers with mid-range box. Dipole dual 12″ subwoofer next to it. Amazing craftsmanship. It’s been over a year since my last post and over 5 since I started this blog. I’m thankful for all of the interest and comments in my posts. I have a lot of speakers and amps to report on since my last post and even more things I’ve learned and want to share with everyone. I’ll re-commit to posting, and am adding new channels to Silver Face Stereo: You can follow me on Instagram @silverfacestereo and look for my Facebook page . In the meantime I’ll share a few images from my recent acquisitions, with a promise of reviews and even more gear to come. Just back from a cleaning if all the pots and switches, including the coupler on the back. A short demo indicates clean clear and even output from both channels. We’re in business! Next step: clean the faceplate, knobs and switches and restore the cabinet. 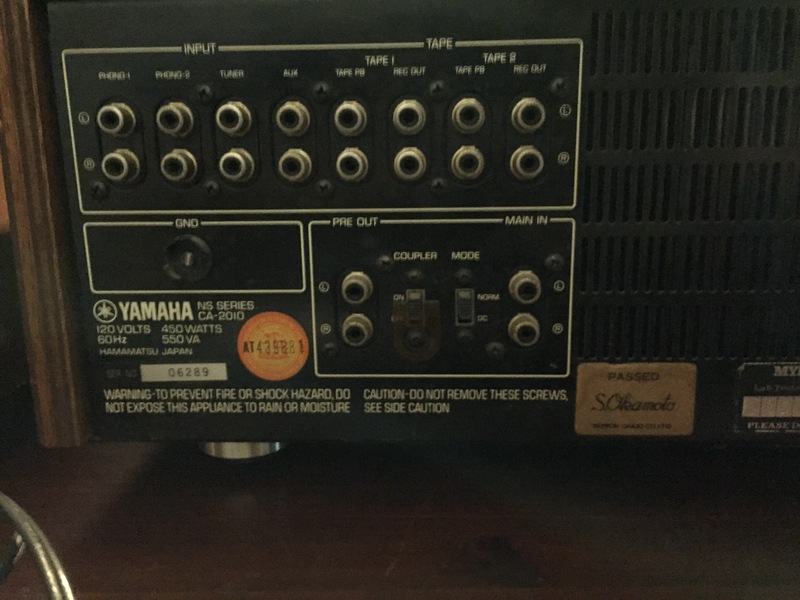 Just picked up a complete Yamaha CA-2010 and CT-1010 integrated amplifier/tuner pair. Everything lights up from beneath a film of dust and grime. I was told one channel is out on the amp. I’m hoping that’s just from corrosion in the pre-power amp coupling switch on the back – a common problem. Will update after a thorough cleaning. 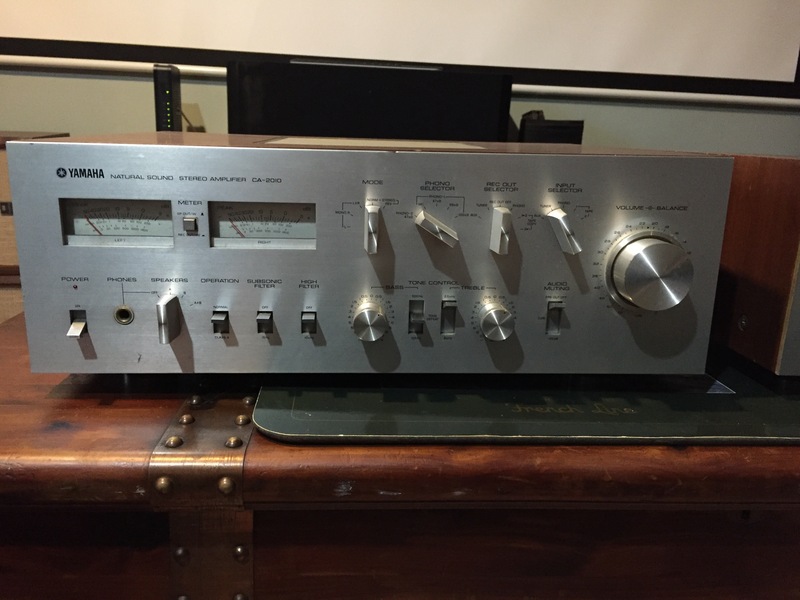 I just found a forlorn Sansui 7070 receiver at a local record store. It’s in pretty good shape – everything is there and it sounds really really good. The lamps in the front didn’t all light up until I banged on the top of the unit. It turns out that the light board is notorious for poor solders. After about 10 minutes of reheating all the solder joints on the board I got all but one lamp to glow. Now it looks great. The fake plastic veneer on the cabinet is peeling so I’m thinking about replacing it with some real cherry veneer on adhesive backing I have laying around. It should be a quick and nice-looking fix. I wouldn’t bother if this thing didn’t sound so damn good. On a lark to test I hooked it up to my very power-hungry Polk Lsi7s and was absolutely amazed – this receiver sounds clear, clean, and amazingly pleasant. And it has the current to drive some pretty inefficient monitors. This thing is staying for a while! I pulled off the vinyl covering from the case and re-veneered with the real cherry I had laying around. Picture below is pre-sanding. Now it’s looking very nice indeed. Looks so nice I may not stain it. I’ve recently had a run of Klipsches come through the house. First was the pair of Klipsch Cornwall speakers in beautiful naked birch finish that I found in the spring of this year. Cornwalls are the flagship of the direct radiating bass speakers in the Klipsch Heritage series. What does that mean in English? It means that Klipsch is all about horns – enclosures which surround a driver and shape the direction of the waves. They are a good way to tune which frequencies are accentuated from a driver, where they go, and how they sound. They also boost efficiency of speaker systems considerably. The biggest Klipsches in the Heritage series, the Klipschorn, Jubilee, and Belle Klipsch, all use a horn tweeter, midrange (also known as ‘squawker’) and woofer in a folded horn enclosure. The Cornwall is the largest of the Klipsch speakers below the folded-horn woofer designs. That means its 15″ woofer just sits in the speaker like everyone else’s designs – it’s not hidden within the cabinet. To get the desired bass, that means the Cornwall is large – 36″ high, 25″ wide, 16″ deep and easily 70-90lb apiece. The pair I had were made in the 1970s and came in ‘builder’ spec – which meant an unfinished birch veneer and no grille. These models were intended to be sold to installers who would add their own veneers or enclosures. By the time I got my pair it had acquired optional grilles and bullnose (the surrounding of the grille on the fascia) and small risers. Interestingly the grilles were nailed on behind the bullnose – no looking at the speakers from the front. Cornwall grille detail. No way to get these off. The grilles were in excellent condition, and the veneers, despite some dust on the lower reaches, were in great shape. I was really worried about the veneers. – birch is pretty soft, and these had survived 40 years with no protection whatsoever. I didn’t want to mess them up. When I got them I didn’t even oil or polish them, just a little warm water on a damp cloth to pull the dust off. They are beautiful. I liked the sound too. Very smooth and well-balanced. I found them very similar to the Klipschorns I used to have but easier to place since they don’t have the corner-horn placement requirement. The forward-mounted woofer concentrates the bass right with the mid and tweeter. I didn’t crank these enough to have any problems with too-forward treble or mid, just a very nice presentation. Even though they are much easier to place and live with than the Klipschorns, these were still too wide for my space and found a new home in a beach house in Deleware. They came along with a pair of Tangent 5000s, which are seen in the pictures alongside the Cornwalls. The Tangents were a gap-filling model line between the Heritage line and later CF and Reference model lines. These Tangent 5000s were basically a Heresy II with a passive radiator on the back in a much larger enclosure. I bought them because the components and crossover were the same as the Heresys, and I planned on putting them into a smaller and better-damped enclosure and get a modded Heresy. But I couldn’t gel with the sound – even with the larger enclosures there was surprisingly little bass – I suspect that a woofer may have been wired out of phase. The downside to the Tangents notwithstanding their great components was the cabinet- it was thin and much flexier than the Cornwalls, KGs, or Fortes I would later have. I’m sure they contribute a lot of negative resonance to the tangent’s sound. They left before I could figure out how to re-purpose the components. Then a little later on I came across a pair of Forte IIs in Walnut. In excellent original condition – the grilles had never been off. I bought them from a record store that had accepted them in trade from the original owner. These I like. Very well balanced with a Tractix mid horn on the front with a 12″ woofer and a 15″ passive radiator on the back. The sound and presentation is exceptionally smooth and well balanced. I’ve heard these described as the best of the Heritage line – advanced and balanced mid and high range horns, good bass response, very good efficiency, all in a manageable size. These are really nice. But alas they could not kick my mighty CF-4s out of the rotation and I don’t have anywhere else for them to go. They were competing for a while against my modded Polk Monitor 7s, but I’ve found that since the Polks’ new crossovers have burned in, they have an amazing synergy with my Harmon Kardon 3380 receiver in my living room and I don’t want to mess up that mojo – I finally have a system with great imaging and detail, good bass (amazing bass for a Monitor 7!) and clarity in a room with terrible acoustics.